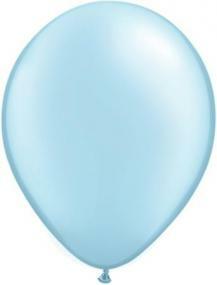 Pastel pearl pale blue latex balloons from Qualatex. These balloons are of the highest quality and should float for up to 12 hours when filled with helium. They each measure 11" diameter when filled. Contents: 25 balloons. These balloons can be filled with air or helium. Mix with white for Christening and Naming Day celebrations. with shades of blue or perhaps other pastels for a pretty summery look.